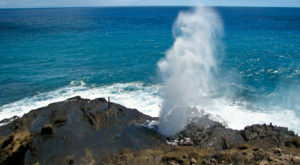 From jungles and rainforests to mountains and valleys, there are parts of the Hawaiian Islands that will transport you to another time and place – perhaps when dinosaurs roamed free? 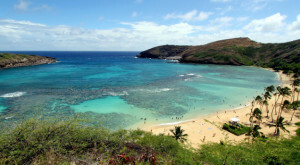 While the Hawaiian Islands were formed long after dinosaurs roamed this earth, there is one mystical place in Hawaii that will easily make you feel as though you’ve walked onto the set of Jurassic Park. 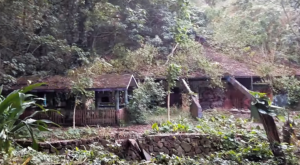 In fact, this lush Hawaiian valley was one of the primary filming locations for both the original Jurassic Park films and the new Jurassic World movies. 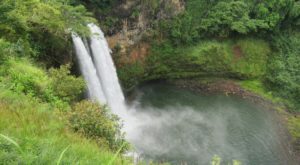 While much of Jurassic Park was filmed on the island of Kauai, the most accessible filming location for the popular movie franchise is found on Oahu. 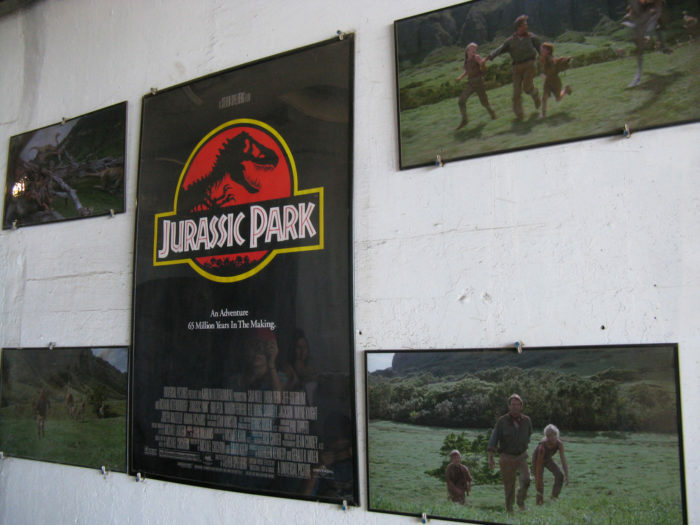 This is Kualoa Ranch, a lush, verdant slice of Hawaiian paradise that has played host to a variety of film and television productions throughout the years — including Jurassic Park. 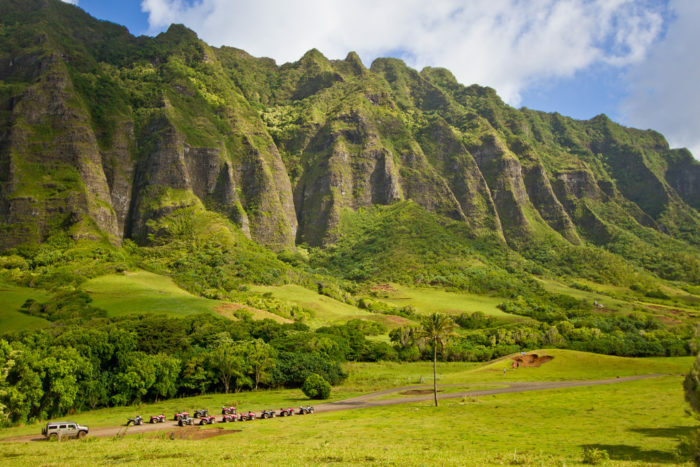 A lush, verdant valley surrounded by towering mountains on three sides, it’s easy to see why Ka’a’awa Valley was used as a filming location for Jurassic Park. It really doesn’t get more prehistoric than this. When Alan Grant and the children find themselves in the path of a herd of Gallimimus fleeing from a T-Rex, they take shelter under a fallen tree. 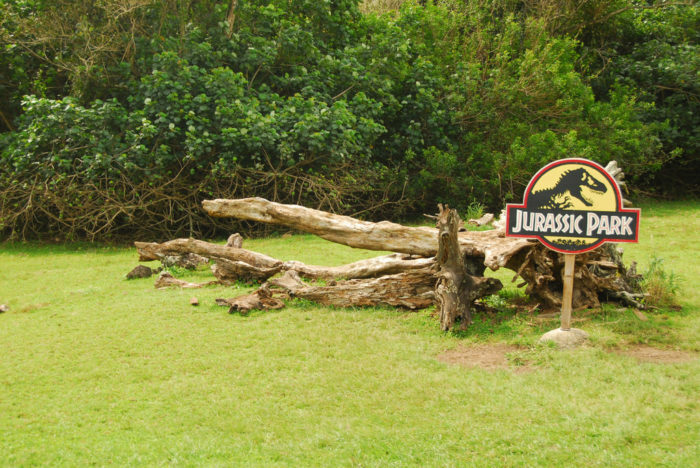 More than twenty years after filming, that same tree remains on the grounds of Kulaoa today, accompanied by a bright sign to make it more obvious. 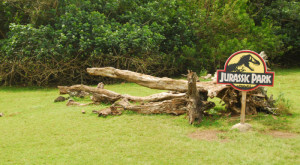 Many other iconic scenes were filmed here, and you might even catch a glimpse of some remaining set pieces, including the Indominus Rex dinosaur pen, the Jurassic Park gate, and the Gyrosphere loading dock. Who knows, you might even spot a real-life dinosaur or two! 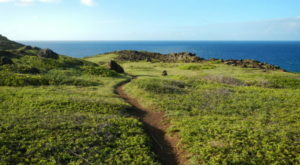 The best way to see the filming locations and sets that remain on the property is to book a movie sites tour with Kualoa Ranch. 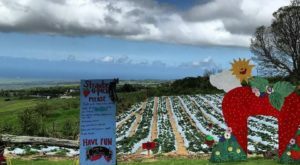 Not only will you be transported to the Jurassic era, but you’ll get to check out filming locations for 50 First Dates, The Hunger games, Godzilla, George of the Jungle, Along Came Polly, and more. 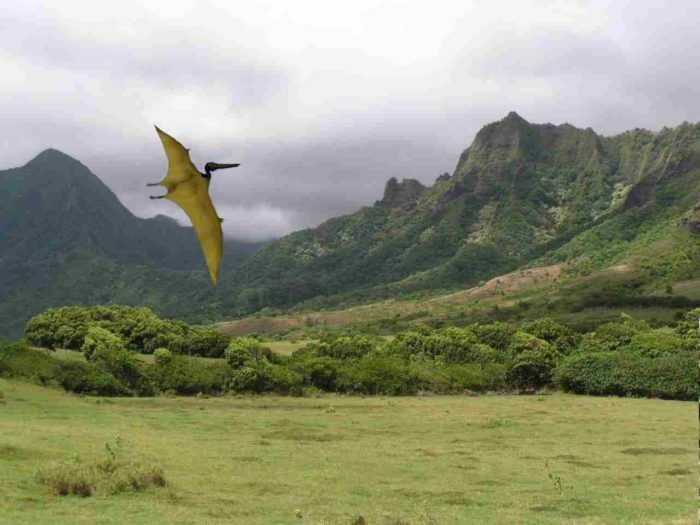 Even though real dinosaurs never roamed this valley, fans of Jurassic Park will love visiting this prehistoric-looking Hawaiian valley. 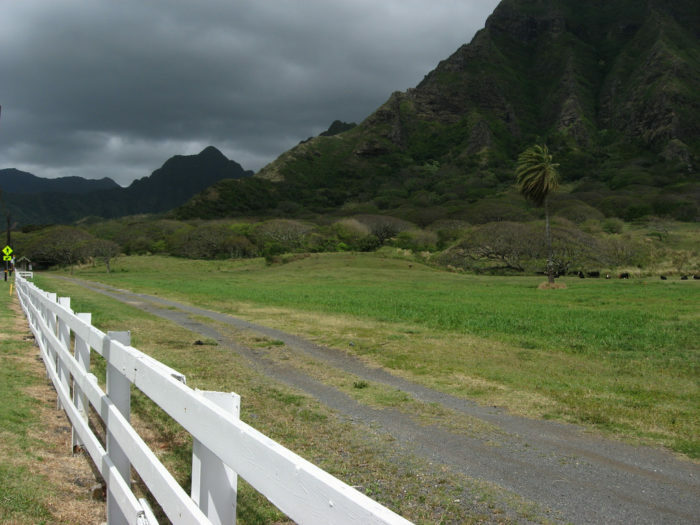 Have you ever visited Kualoa Ranch? If not, what are you waiting for? 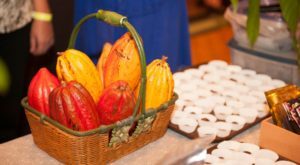 In addition to movie sites tours, you’ll discover ziplines, horseback riding, ATVs, boat tours, and more. 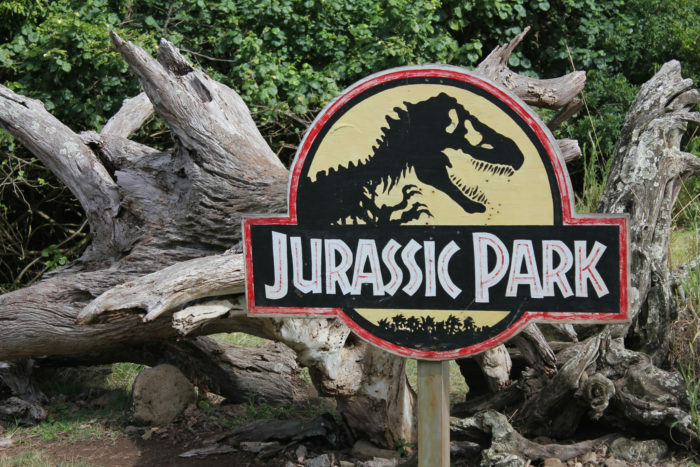 To discover another incredible place used in the filming of the 1993 classic Jurassic Park, click here.